Lead Management Software, Online Lead Tracking, Email Marketing & SFA CRM. "We at "Strategic Operations" use LeadMasterCRM, our market focus is government services and have fou"
I like the customer service and assistance, our business model requires tracking numerous product lines and line items. The LeadMasterCRM provides data arrangement in layers that is logical and simple to use. I am a huge fan of importing data for updates, and new data entry, the LeadMasterCRM accommodates broad data importing by customer, opportunity and by job codes. I also like the report functions such as; report subscriptions. All I have to worry about is the data entry the reports are automated. The E-mail blast functionality is also an excellent feature, telling me how many e-mails were read etc. Can be a bit slow at times but the Customer service team will correct this if you send a request. The LeadMasterCRM provides a single point of Collaboration for our business teams and back office support all customer centric. We have the ability to speak to our customers in a big way, while at the same time we have the ability to read recent update notes, track everything else from quotes to shipping documents. "Leadmaster is a powerful and flexible CRM System"
We leverage leadmaster CRM for a wide spectrum of clients. We have found that Leadmaster is very powerful and able to address requirements for many different clients at reasonable prices. The system is also very straight forward to develop and maintain new client applications. We have found that Leadmaster meets all our needs. Leadmaster has solved requirements from straight forward CRM to Outbound marketing applications, to real time lead integration applications. Leadmaster is powerful without the complexity and expense of aSalesforce. I like that it is very simple to use, but it is almost too basic for a CRM. If you are a very small, basic business, than this product might be okay for you. Otherwise, look for a more robust option. It is great for holding/keeping track of our older data, otherwise, it does not do much for us anymore. I love that all my leads are in one place. I also appreciate that it sends me reminders to reach out to leads I might have forgotten about. How difficult it is to look at a certain area. I can’t search based on Birthday or lead status at a certain facility. It is also very time consuming to put leads into LeadMaster. It also still sends you reminders on leads that you have gotten enrolled and they are no longer leads. Benefits is that it reminds you of leads that you might have forgotten about, which helps a lot. It helps keep everyone accountable as well and you can see how your fellow workers are doing as well. "Good program for capturing leads"
Great user friendly program that is great for storing and working with leads especially in a telemarketing capacity. Stores a lot of info and it’s easy to send leads from within the program. Can sometimes be quirky and can be a little difficult to run various reports that are needed to evaluate efficiency of callers. Use this for telemarketing campaigns. Can search within program to see if we have contacted leads before. The ability to make detailed notes is very helpful to our various call campaigns. "Custom software without a Custom price tag... "
Easily acomodates your business/industry needs. Would like to see a little more user friendly for the novice starting out with a CRM. Off the chart support team! Accountability for long term customer relationships. "LeadMaster is a great multi-purpose web-based solution"
LeadMaster offers a comprehensive CRM at a great price. It allows our company to manage customers and leads efficiently. The sales and customer service support is fantastic as well. There's a lot of help on the backend in learning the product with the videos and instructions. The library is an excellent tool. Currently, the email campaign editor does not have a working spell check function. Recommendations. But I really have no prevailing concerns. The monthly subscription covers installation, upgrades, maintenance, and software licensing. LeadMaster also offers personal guidance from their LeadMaster Partners. Easy-to-use, easy-to-learn, with a hefty number of sales lead management offerings. "Customization Options and a Straight Forward CRM "
The ability to create custom workflows and follow-ups. Sometimes the display and interface could be a bit disjointed. Request an extended setup package to test and tweak follow-up sequences and lead routing. Solving lead management with being able to disposition lead status and follow-ups. it helps me stay organized! i appreciate that it keeps contacts in one place. i wish i could integrate it with outlook. i am not aware of any business problems. Just a learning curve, as with everything. It keeps everything at your fingertips. * We monitor all LeadMaster reviews to prevent fraudulent reviews and keep review quality high. We do not post reviews by company employees or direct competitors. Validated reviews require the user to submit a screenshot of the product containing their user ID, in order to verify a user is an actual user of the product. Hi there! 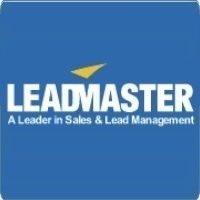 Are you looking to implement a solution like LeadMaster?